How Can You Miss Chuck Long If He Won't Go Away? Who has the best job in football? Chuck Long, who is getting paid $715,000 a year to not coach San Diego State, or the consultant getting $125 an hour to figure out how to get rid of him? 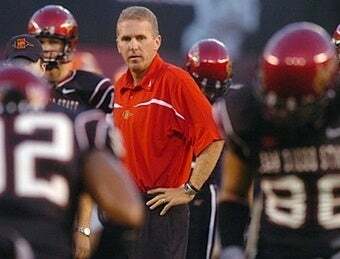 Long was fired last year after three delightfully lousy seasons as the Aztec's head football coach, but his contract entitles him to two more years of full salary and continued employment at the university. His job now? Holding campus "office hours" as he works on other "projects." As long as Chuck shows up every day, he still gets paid. His contract terminates if he ever finds another job—but who is going to pay Chuck Long $715,000 to do anything? There's no way he's giving up a gig this sweet. So in a Costanza-like turn of events, he finds himself in the enviable position of getting paid to do nothing by an employer that doesn't want him around. So what's the school's solution? Spend even more money, by hiring a former labor relations manager to try and negotiate some sort of settlement that Long will never have any reason to accept. It's so crazy it just might work. I don't think anyone has received so much money to do so little work since the Detroit Lions drafted some chump from Iowa to be their quarterback.